frälse : äf : illü. 여덟 예어트인과 22명의 노스인이 빈랜드에서 멀리 서쪽으로 (이?) 수집 여행을 떠났다. 우리는 이 돌에서 북쪽으로 두 (주거지?) 일일 여정으로 야영을 했다. 어느 날 우리는 낚시를 했다. 우리가 집에 온 후, 피와 죽음으로 붉게 뒤덮인 10명의 남자를 발견했다. 아베 마리아가 악에서 구했다. 켄싱턴 룬돌은 정면과 측면이 룬 문자로 덮여 있는 경사암의 90kg 판이다. 스웨덴계 미국인 올로프 올슨 오멘은 미네소타주 더글라스 솔렘 시골 마을에서 1898년에 그것을 발견했고 가장 가까운 정착지, 켄싱턴의 이름을 땄다고 주장했다. ↑ 가 나 Richard Nielsen and Henrik Williams (May 2010). “Inscription Translation” (PDF). 2012년 3월 25일에 원본 문서 (PDF)에서 보존된 문서. 2011년 6월 11일에 확인함. Thalbitzer, William C. (1951). 《Two runic stones, from Greenland and Minnesota》. Washington: Smithsonian Institution. OCLC 2585531. Hall, Robert A., Jr. (1982). 《The Kensington Rune-stone is Genuine: Linguistic, practical, methodological considerations》. Columbia, SC: Hornbeam Press. ISBN 0-917496-21-3. Kehoe, Alice Beck (2005). 《The Kensington Runestone: Approaching a Research Question Holistically》. Waveland Press. ISBN 1-57766-371-3. 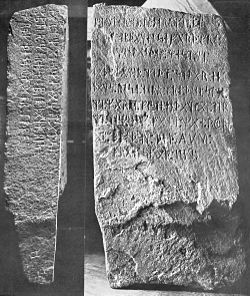 “Kensingtonstenens gåta – The riddle of the Kensington runestone” (PDF). 《Historiska nyheter》 (스웨덴어 and 영어) (Stockholm: Statens historiska museum) (Specialnummer om Kensingtonstenen): 16 pages. 2003. ISSN 0280-4115. 2008년 12월 19일에 확인함. Anderson, Rasmus B (1920). “Another View of the Kensington Rune Stone”. 《Wisconsin Magazine of History》 3: 1–9. 2011년 3월 31일에 확인함. Flom, George T (1910). “The Kensington Rune-Stone: A modern inscription from Douglas County, Minnesota”. 《Publications of the Illinois State Historical Library》 (Illinois State Historical Society) 15: 3–44. 2011년 3월 31일에 확인함. 360 View of Rune Stone Zoom into and view the stone just like you were at the museum.